Recently, I looked at one perspective on a discovery in 1933 of wild hops in Massachusetts. 1933 is the year beer was re-legalised in America. That particular account did not view the wild vine as potentially useful for commercial brewing. Rather, it was reflective, musing on the hop as an emblem for a lost pioneer spirit. 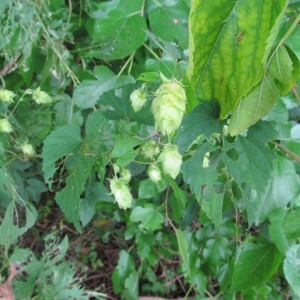 Since the early 1900s wild hops have been used in breeding programs, famously by Professor Salmon at Wye in England. This has resulted in some well-known varieties. Bullion and Brewer’s Gold are two early examples. Both were widely used in North American and some other brewing. But commercial brewing eschewed the wild hop as such until quite recently. One reason was its low yields compared to evolved commercial varieties. This September 1941 article in the Waterville Times, in New York State, reports dry and wet data for different hop varieties grown experimentally in 1940. See the low numbers especially for Cats Tails, a type of Neomexicanus. The same applied to Canada Red Vine, another hop considered of wild origin although grown commercially at times in New York State. Despite this, some modern hop researchers consider that Canada Red Vine has potential for renewed commercial use. Bo McMillan reported two years ago on work being done in North Carolina, see this All About Beer story. (A couple of commercial varieties similarly underperformed in the 1940 tests but the writer noted they were likely weakened from disease). Sierra Nevada Brewery used Neomexicanus a few years in a beer, to great effect IMO. Sierra Nevada, the king of the craft brewers for many, was part of an early group exploring this avenue. Probably homebrewers started it, as a number of their online forums discuss wild hop brewing in the last 10 years or so. Ontario is not exempt from what is a trend, or a small trend. Pleasant Valley Hops in Prince Edward County, ON, a farm that grows fruit and hops, markets its pleasingly-named Wild Loyalist, see details here. The hop is thought to have been brought by Loyalist settlers arriving from the U.S. after the American Revolution. The tourist site The County offers good background on the inspiring personal and business story of the couple behind Pleasant Valley Farms. Tavistock Hop Company in southwestern Ontario is growing a hop it calls Heritage, found 30 miles to the east on the edge of a former hop yard, in Cambridge. The type is still being examined to confirm its identity. We took a short walk down to the river (about a block from his house) and before long he [a contact who helped Wynette locate the hops] had re-located where he had seen the plants the year prior. To our amazement, there they were! In the very place where I had walked by just a few weeks prior, we just hadn’t looked up high enough. If not for the cones on the plants, they would have been hard to identify because much of the leaves had been defoliated by insects. I inspected the cones and couldn’t see any seeds which to me means there must not be any males nearby and therefore these plants were all female which would be what you’d expect if they were from the old hop yard. These plants were right at the edge of the old farm, the rest of the area now covered by subdivisions. I can’t say with 100% certainty, but my belief is that these roots are part of plants that have been in the ground for over 100 years on land that ceased being a hop yard nearly a century ago. How about a beer that actually uses a Canuck wild hop? Sure. Railway City Brewing in St. Thomas, ON has made its Graveyard Beer, after the moniker Graveyard Hop grown by Vandeslyke Hop Farm. The name is less gruesome than it sounds: the wild vines were found at a cemetery once used for yet another old Ontario hop plantation. Brewed using Ontario-grown Bartlett Pears from the Turville Family Orchards in Port Stanley, this seasonal sipper also features locally grown hops from Vandeslyke Hop Farms and what they call ‘Graveyard Hops’. What’s Graveyard Hops? Simple: wild hops from an 1800’s Hop Field which is now a Graveyard. Hopefully the beer is appearing again this season. One can be sentimental about the wild hop, about thoughts it evokes of pioneer and past days. But even better, you can literally taste the history when wild hops are harvested and dipped in boiling brew to form magical beer. When tasting the results, think back on olden times, you are reliving a tangible part of it.